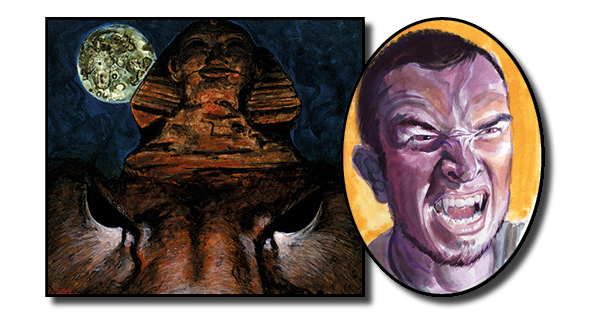 Art by Carmen Cornet from the upcoming set of preconstructed decks. After months of horribly sunny weather, many of us now enjoy cozy, rainy dark autumn, well suited for shutting yourself in your crypt by a table with your favorite friends … enemies … frienemies? Oh, how I love to host them … socialize with them … manipulate them … dominate them! An official VEKN Facebook group has been created: “Vampire: Elder Kindred Network”. Here you can, under your own name, discuss anything that you previously used to discuss on the VEKN.net forum. The old forum will continue as normal – this will just be an alternative way to talk about our favorite game. The guidelines for posting are in most ways the same as for the VEKN.net forum (plus any general Facebook rules). Please, read those rules in the top announcement before posting. 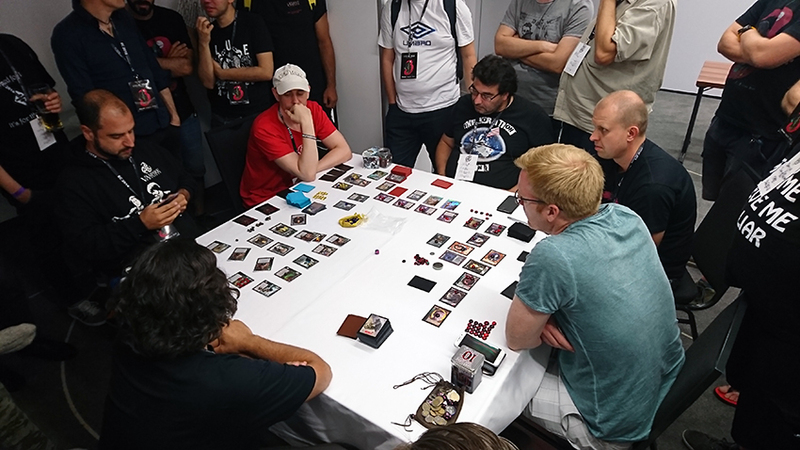 Also, as there won´t be any subsections, please remember to add a post topic and/or start your post with concrete subject, for example “Rules question:”, “New card idea:” or “Tournament announcement Mexico City:”. • A set of preconstructed decks have been playtested by many groups, coordinated by Darby Keeney. 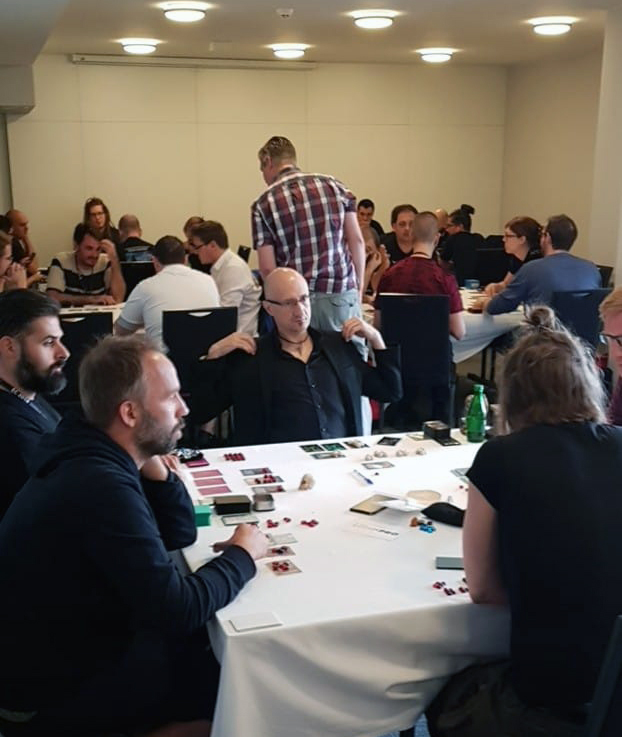 Rules Director Vincent Ripoll is now struggling with playtest feedback on template issues to make all future cards worded in the best possible way. Artwork for the new cards in these decks is complete – one of the pieces can be seen at the top of this newsletter, by Carmen Cornet. Isn´t it fantastic?! • Almost 1 000 kilograms of VTES cards were finally delivered from the print shop in Belgium. 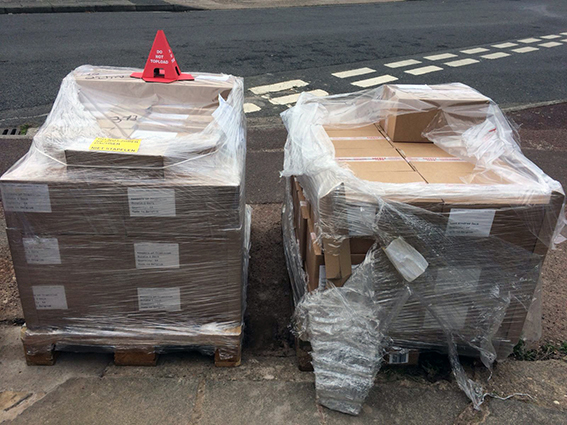 They are to be sent out to our first non-US distributors, and from there to stores and customers. This first batch is Lost Kindred and the two Keepers of Tradition reprint bundles, but more products will be made available this way gradually. • Black Chantry will appear at Spiel ´18 in Essen, Germany on October 25-28. Spiel is the world’s biggest consumer fair for gaming, with 80 000 square meters of exhibition space, over 1 100 exhibitors and an expected 180 000 visitors. Please drop by the booth next to White Wolf, and please direct your curious friends to a demo game of VTES! • A very special surprise product will appear early in October. Watch out for that announcement! Example of a heads-up play in Lackey with Toreador AAA vs Euro Brujah. VTES ONLINE ON LACKEY – HOW DOES IT WORK? People say VTES can´t be played online. Igor and Martin do not agree! They are two of the organizers behind VTES on LackeyCCG, the application for playing almost any collectible card game online. We had the opportunity to ask them some questions. Igor: Hello, my name is Igor Beslin. I am a VTES and chess player from Serbia. I play chess for team Bezdan. In the last 11 years I attended every International Championship of Vojvodina. In my free time, I also like to watch football. My favorite team is Red Star from Belgrad. In the last couple years I also organized five VTES online tournaments on LackeyCCG. Martin: Hi, my name is Martin Weinmayer. I am a VTES player from Austria. In my free time I love traveling the globe to compete in VTES tournaments. Other hobbies include computer games (mmorpg, moba, strategy), board games, pen & paper rpgs and all kind of sports. I have been leading a competitive World of Warcraft guild for 3 years, so I am familiar with building and maintaining an online community. Martin: LackeyCCG is a tool for playing any type of card game online (or offline in solitaire mode). It is also a great tool for building and designing decks. You basically meet in a gaming lobby where you can chat and set up games with fellow players. The server is maintained by an American named Trevor, who is usually around in social media if we need help. The plugin used to play VTES on Lackey is maintained by Fernando Cesar, a Brasilian VTES player. Eternal thanks to both of them. Igor: For me Lackey is a good place for fun. There I test my deck strategy, play with friends, talking and laughing. Since I don´t have a playgroup in my near vicinity, it is currently my only place to enjoy and play VTES. Some day I hope I can attend the European Championship and test my skills acquired in online play. When did you start playing online? Who introduced you to Lackey? Igor: I started to play VTES in August 2011, and on Lackey in December 2011. The player who taught me to play VTES introduced me to Lackey. Our first idea was to test our decks for real life play. At that time my English was not very good, and that´s why I very rarely played online. Unfortunately I lost my playgroup shortly afterwards, and then I focused to play VTES on Lackey. Can anyone play VTES on Lackey? What do you need? Igor: First you need an internet connection. (Editors note: Currently Lackey run over Windows, MAC, iPad and Linux with emulator. No Android support yet). It is also important that you like VTES and have some free time to play. Martin: Anyone can play, yes. If you are already a VTES player in real life, it takes me about 15 minutes to explain to you all the online mechanics used to play. It is surprisingly similar to real life games. It is also a good place for new players to explore and learn VTES at their own pace. You can play training games (solitaire mode even), work on your deck, or find other new players to explore the game together. What are the main differences between playing on Lackey and playing the physical game? Igor: I played real life VTES only as a beginner, and I also played with beginners, so I probably cannot get you the best answer. But the obvious differences are: you play the game on PC, not with cards. You don´t talk, you write messages, although the group playing with the voice-software Discord is growing each week. If you want to play VTES you do not need to travel, you can find online players and play with them. How do VTES tournaments on Lackey work? Igor: I organized five tournaments via Lackey until now. People choose their schedules (days and hours), and based on those schedules I made a calendar and tables for the games. Some of the tournaments took more than a month to finish, but the last one was finished in 8 days. We are planning our next online tournament to be a 1 day worldwide event coming this late October. Martin: Currently we are organizing an Online World Championship. Games are played in a league once every Monday, from the 3rd of September until the 3rd of December. This is a total of 14 games, and you need 6 games to get a final ranking. There is still time to join! Players can choose to play in either the American League (7 pm PDT) or the European League (9 pm CEST). 50 players have participated in this first Online World Championship already. At the end of the league stage the best players from both leagues will fight for the Online World Champion title. The World Final will be played and streamed live on TwitchTV on the 15th of December. How can Lackey help supporting the game? Igor: Since I lost my playgroup, Lackey is the only way for me playing VTES. I hope that I will find a playgroup someday, and go to real life tournaments. Martin: The community needs people playing the game, and there are lot of reasons why people stopped playing. Maybe they lost their playgroup like Igor, or they don´t fit into their playgroup, or they just don´t enjoy playing with those same people anymore, or they simply don´t find enough time to meet up in real life regularly. Online play can help with all of that, connect you to a wide range of players throughout the world and lets you keep playing the game. Because it’s so easily accessible, Lackey encourages you to experiment with new decks, and then buy or trade the cards needed to play. A gathering of Lackey players at EC 2018 in Warsaw: Marius, Martin S, Bram, Martin W (interviewed) and Serge. Are any deck type better or worse to play on Lackey? Martin: I played almost all my tournament decks on Lackey with same results as in real life. So no, I don´t think any deck type is better or worse online. If I want to start playing now, where do I go? Thanks for the answers guys. See you in hackerspace! Here is a list of questions asked during Days 1 and 2 of the EC (and Polish NC), answered and compiled by the Head Judge Pascal Bertrand. Ingrid Rossler - can I use the extra transfers immediately? I play a Torn Signpost. I play an Increased Strength. I handstrike. Why is it not for 5? Because handstrike is not a strike requiring Potence. Kindred Spirits cancelled by Veil of Darkness. Am I locked, and can I play it again? No, and yes (like a DI). Sascha Vykos’ controller plays a Wash on a Master. Can he draw before playing the Wash? No. First goes Wash, then the opportunity to draw. Malkavian Dementia: the stolen vampire is locked. Do you return them locked or unlocked? An imbued with React with Conviction is trying to cancel Xeper’s ability. What happens next? Xeper is unlocked, and can do the same action again. 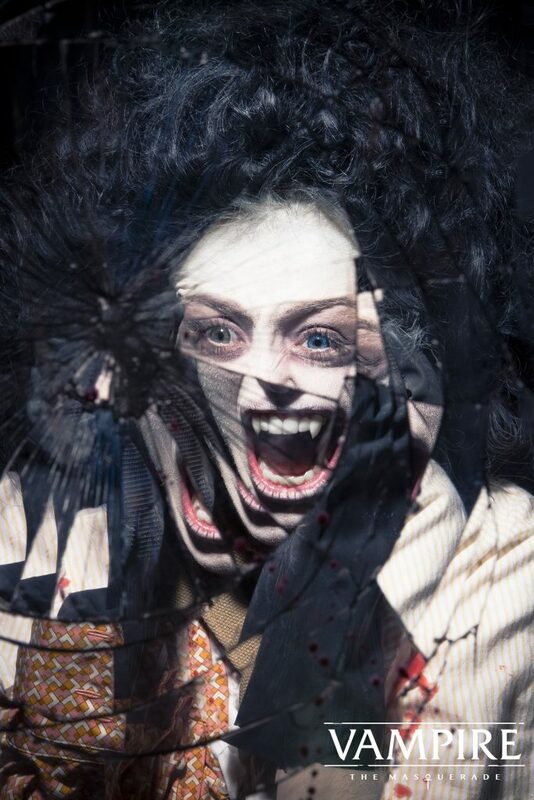 Who controls the Art’s Traumatic Essence? It is a minion card, so the controller of the minion it is attached to. Can I play multiple Spying Missions against the same Methuselah? Yes. You play it before resolution, and the burning happens at resolution. I played Forced Awakening, and they play Tangle Atropo’s Hand. Do I burn blood? Can I change the terms of a “discussed Banishment” after playing the card? Yes. There are no terms before the resolution. Can I stick to a deal if I have a GW? I have drawn for Uncoiling 2 turns ago. What should I do? We removed a Dreams and didn’t fix anything else. A contested imbued comes back during the unlock. Can he get a conviction (normal unlock conviction)? If they yield their title, do I get mine back immediately? No, wait until your next unlock phase. Two players left. Can we deal 3-2 if one player has 3 VPs already? If I hunt then play Change of Target, can I hunt again? I contest Unmada. Do I get momentarily +1 hand size? I Dodge against Flash Grenade. What happens? You’re OK: Flash Grenade has no effect on the dodging minion. Nephandus in combat with minion with Murder of Crows, what happens? Nephandus takes unaltered damage from Murder of Crows (not opposing minion). Opposing minion plays Serpent’s Numbing Kiss, I play Bond with the Mountain. Is my vampire locked or unlocked? In combat, I get hit by Flash Grenade. Can I play Cats’ Guidance? Yes. End combat first, and then, at the end of the action, play Cats’ Guidance. You would be unlocked. My grand predator is bleeding me for 2 and has a Spying Mission against me. Can I play Archon Investigation on him at some point? No. AI is played before resolution, whilst Spying Mission burns at resolution. If I play basic Majesty against Flash Grenade, do I get locked? He played Tangle Atropo’s Hand on a Govern the Unaligned. Why can he do it again? Because it never reached resolution. It’s my minion phase, but I forgot to take the Edge. Can I gain 1 pool from it? Dark Influences is in play. I play Delaying Tactics on a Parity Shift. Is my Delaying Tactics cancelled? No. It isn’t a card that cancels a card. I bleed. My prey doesn’t block, so I play Conditioning. My grand prey wants to Eagle’s Sight. You should ask other players if they want to block after your prey declines. Can I play superior Indomitability for a press when there is no damage to prevent? I play Concealed Weapon and Flash Grenade. But they DI the Concealed Weapon. Where should my Flash Grenade (that was in play) be? Flash Grenade should not be in play. It remains in the hand until Concealed Weapon reaches resolution. I am ousted, but I previously played a Dark Influences. Where does it go? You control the card, so it is removed from the game. I replaced a card without checking for Veil of Darkness. What should we do? I forgot to do stuff for Constant Resolution (1 counter) when I was at 1 pool on my turn. Can we get extra time because we called the Judge 3 times? No. Judge grants time, not players. Do I get to see the replacement card after using Le Dinh Tho’s ability? 4-life Shambling Hordes declares a hand strike against Lucian the Perfect. What is the amount of damage the Hordes inflicts? Ashur Tablets: Do I announce which cards I want to get back when I play the third one? No. The effect is to put them in play. What they do there is irrelevant. Pentweret tries to steal an Imbued with his strike. The Imbued uses React with Conviction. Can Pentweret do it again? Can I steal an Imbued with just one corruption card that adds corruption counters? No, you need to match cost, which is the number in the green circle. Can I play a Telepathic Misdirection with the minion whose Telepathic Misdirection just got cancelled by Hide the Mind? Are Stone Dog and Razor Bat animals? I play Terra Incognita on a Telepathic Misdirection. Can they block? No. The Telepathic Misdirection is cancelled, but they have already declined blocks. My prey has 1 pool. I have Lutz and call a KRC. I put 1 on my prey, and 3 on my grand prey. Who burns 1 pool from Lutz’s ability? Lutz’s ability triggers after the referendum, so after the prey burn 1 pool (and got ousted) and the grand prey burned 3 pool. Can I play Villein on an empty vampire? Can I play superior Resilience to prevent damage from both Carrion Crows and Aid from Bats? Can I play Hidden Strength for a press if there are no damage to prevent? Can I bring Emerald Legionnaires in play from my ash heap if I don’t control any? No. You need at least one. Can I play Delaying Tactics before terms are set? Does Alexandra’s ability work in torpor? Can I play Sense the Savage Way + Eagle’s Sight to cross-table block? No. Sense the Savage Way is a block attempt declaration, so you can’t play it to cross-table block. Can I use Psyche! against Unleash Hell’s Fury ? No. You’re not in combat with it. Can Nephandus gain more than its starting life after burning people in torpor? Yes. Allies don’t have a maximum life. Toreador Grand Ball’s locked vampire is burned, does the other one remain unblockable? If I Touch of Clarity a Govern the Unaligned, can they play Govern the Unaligned again? Dragos plays superior Chiropteran Marauder, does he burn any blood? Yes, 1 to Chiropteran Marauder’s cardtext. I get a Rowan Ring with Horrid Reality; does it get shuffled back in my deck afterwards? If I’m acting, can I play Target Vitals after the opposing minion declared their strike? If I bleed and they play Deflection and I play Touch of Clarity, can the same minion play Deflection? Is gaining 2 from the Rack mandatory? Yes (currently by card text). We are in my influence phase, but we realize I played an I Am Legion to cancel a Telepathic Misdirection while Dark Influences was in play, and then I played Enkil Cog. How do we fix this? Can I play Will-o'-the-Wisp when no one declares blocks? My predator play Enchant Kindred to bleed me, can I play On the Qui Vive + Touch of Clarity? If they do, can I do it again? A player didn’t pay for the contest for several turns, and now we are in his minion phase and he didn’t pay. What do we do? Can I play Toreador Justicar and chose another vampire than the acting? Can Jerry’s ability be used when he is in torpor? A vampire with a contested Pentex Subversion is banished. Does the other Pentex come back? Yes, during the unlock phase of the controller of the other Pentex. My grand predator is bleeding for one, deflected to me. I have 3 pool. I play On the Qui Vive and My Enemy’s Enemy (which is illegal per cardtext) to deflect back to my predator. If my opponent in a duel withdraws, how many VPs do I get? Two players want to Life Boon the same player, what happens? The clockwise order prevails when it comes to who gets to play a card first in this situation. If I attempt to burn Smiling Jack and get blocked, and unlock, can the same minion do it again? I announced a diablerie on my prey, but then my prey convinced me not to do it. Can I rollback? No (but the prey can block). Can I play intercept cards when I’m not attempting to block? A Telepathic Misdirection is cancelled with Direct Intervention, can the same minion play another Telepathic Misdirection? Delilah invited Alexandra to the Toreador Grand Ball. However, Alexandra got afraid of Mekhet. And burned. Is Delilah locked forever? She doesn’t unlock as normal, because Toreador Grand Ball is still there. I think I didn’t take the pool from my Ashur’s Tablets, 10 minutes ago. Can I On the Qui Vive + Touch of Clarity an action card? Can I play Eagle’s Sight to attempt to block even though I don’t have any intercept? Can I use my Warsaw Station to save my vampire from Vulnerability? I play Mind Numb on Anson. Does it burn during my unlock phase or their unlock phase? Can I burn a Blood Doll from a vampire in the uncontrolled region (moved there by Banishment) with a Vessel? No, the Blood Doll is not in play. Would I be allowed to transfer out at the end of my next turn? V5 NOW IN STORES – AND IT´S A HIT! The latest edition of VTES “mother game” Vampire: The Masquerade has been in stores for about a month, at it seems to be a great success. Old fans like it, new fans like it, even game reviewers like it. And White Wolf has a lot of stuff going on to promote the game. 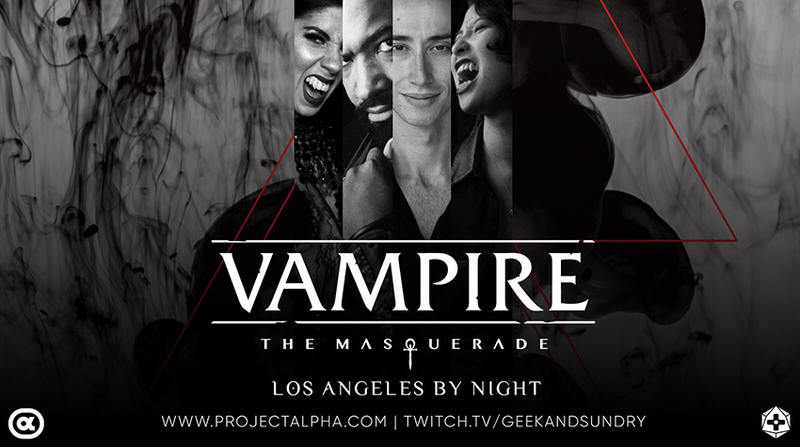 For example, check out the Los Angeles by Night campaign played on Geek and Sundrys Twitch-channel, with WW´s own Jason Carl as Storyteller. "If you're gonna play the game, boy, you gotta learn to play it right. You've got to know when to hold 'em, know when to fold 'em, know when to walk away, and know when to run." Using my specially light-safe travelling coffin I have been to Warsaw. Poland, the blessed land of bison grass vodka and walrus-mustached union leaders, and it delivered once again when it comes to pleasant conflict with other Elder Kindred. Organisation was flawless (except for the traditional Archon trouble), accommodation was excellent and vampiric conflicts were exiting. Good times! Congratulations Ivan Chebunin of Belarus, the new European champion! He won the most prestigious of the five tournaments that were played during August 24-26 in beautiful Warsaw, Poland. On Friday: The “Last Chance Qualifier” gathered 108 players. Not really a last chance qualifier as in old times, but a big standard constructed tournament with a special twist: the finalists also qualified for EC Day 2. Winner was Enrico Destefano of Italy, playing a Giovanni Khazars Diary swarm deck. Congratulations Enrico! EC 2018 LCQ final table: Enrico Destefano (Khazars Diary swarm), Martin Weinmayer (Stanislava sb/vote), Kamel Senni (!Tremere Nephandus), Martin Schumacher (Computer Hacking weenies with Flash Grenades) and Alexandre Bustros (Turbo-Erlik). 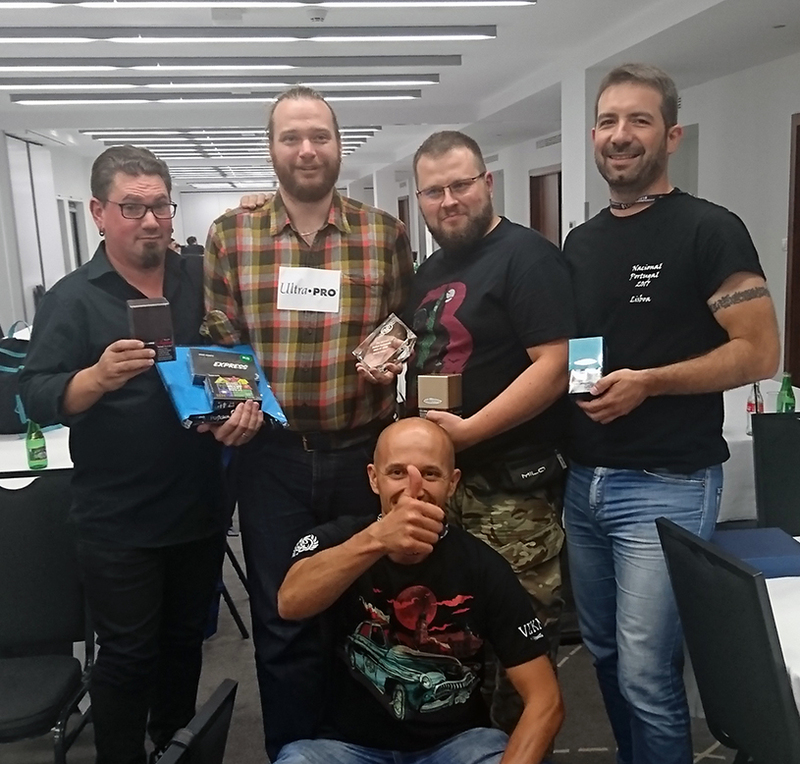 On Friday: Immediately after the LCQ final, another final was played: the very prestigious VTES European Grand Prix (VEG) final, with the five players that had gathered most points on the VEG tour of Bologna, Mechelen, Madrid, Budapest and Helsinki. 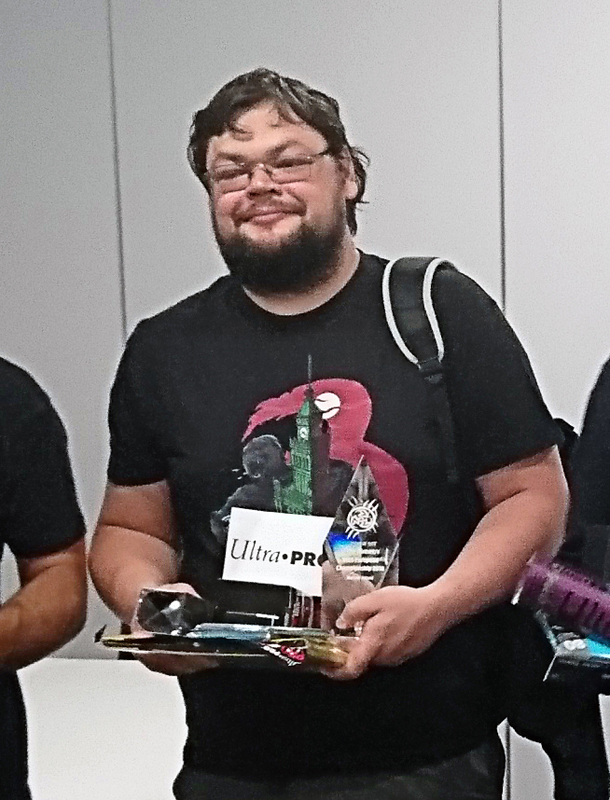 The VEG Champion of 2018 was Mika Nurmikolu of Finland, playing a Goratrix wall deck, scoring the win with a well-timed Life Boon. Congratulations Mika! EC 2018 VEG final: Mika Nurmikolu, Danilo Torrisi, judge Orian Gissler, Martin Weinmayer, Nicola Lonari and Alain Grenier. VEG 2018 champion Mika Nurmikolu and VEG organizer Orian Gissler. 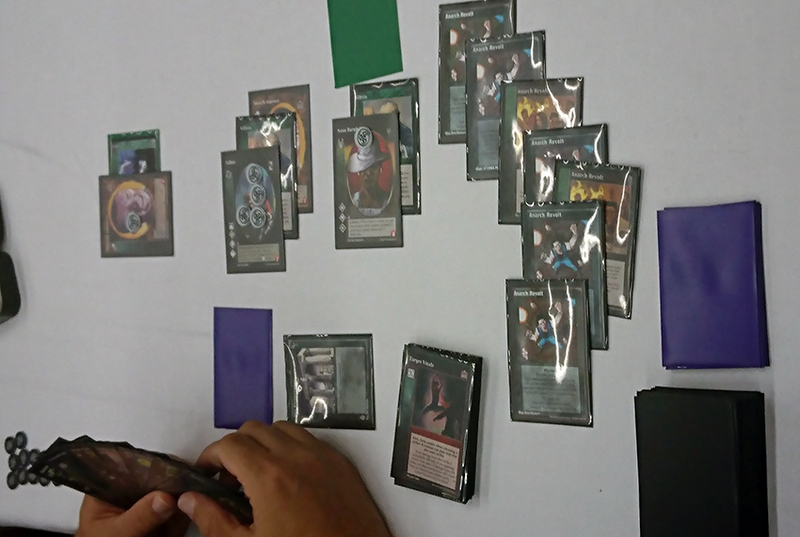 ... which after about 10 hours was won by Bram van Stappen of Belgium, playing a Cybele & Aksinya MMPA bleed deck. Congratulations Bram! On Sunday: Polish Nationals 2018! 72 attendees felt the urge to become the Polish champion in this standard constructed tournament. Winner was Randal Rudstam of Sweden, playing an Ahrimanes “Deadly Kittens” rush/wall deck. Magnus "Ober" Söder had seven Anarch Revolts in play at the final table. That ousted two players, but that was not enough to win! EC 2018 finalists: Marius Iscru(FRA), Ivan Chebunin (BLR, champion), Vincent Ripoll (FRA), Kim Nilsson (SWE) and Otso Saariluoma (FIN). Another spectacular happening from the EC weekend was of course the first appearance of non-print-on-demand VTES cards from Black Chantry. Lost Kindred, Keepers of Tradition reprint bundle 1 and bundle 2 were for sale, and will continue to be at various stores from now on. More information about that soon! Many thanks to head organizer Radoslaw Szewski and all his crew for a wonderful weekend, and thanks all who turned up. Hope to see you all and many more next year in Paris! Both the EC and the VEG circuit were sponsored by Ultra Pro. Congratulations Ivan, and thanks for giving us the opportunity to interview you. First question: the EC is a 2-day event. How did it go day 1? What deck did you play that day? - All three days I was showing pretty stable result - 1 GW and around 5 VP. Day 1 I was playing Followers of Set stealth-bleed deck based on Serpentis. I really like that deck. It is fast, but doesn't have real defense and in the third round I got really stuck with my crypt. - I've had three options - Lutz with friends, Salubri and an AUS/PRE bounce/bleed deck with Jost & Rebekka. After a discussion with my teammates (especially with my wife) the decision was made for the AUS/PRE-deck. I've had not enough confidence in other decks I guess. Analyzing decks that I encountered I think I made the right choice. What are the strengths and weaknesses of that deck? Any prey or predator you like and don´t like? - It's not easy for me to speak of this deck properly because I've borrowed it from TWD and just made some changes. So this question should be transferred to Otso Saariluoma, who built the “original” (by some bitter irony he was my grandpredator in the final!). From my point of view my preferable predator is mid or high-cap stealth bleed. Best prey would be a deck that can't really bounce or handle Majesty. The deck´s strength is consistence – through the whole day I've had perfect balance of pressure and defense. It´s weakness is Immortal Grapple. And decks with a lot of minions could also be a problem I think. Also if there are too little pressure from the predator, the deck can be jammed on reactions, but that happens rarely. So what about the Day 2 tournament - how were the preliminary rounds for you? - First round was finished pretty quickly because my predator was a Potence-weenie deck. I've managed to perform 1 action but that was all for me. The second round was better. I've played Scourge of the Enochians on the first turn that badly hurt my predator, and I've had manageable amount of pressure from Bram van Stappen's AUS-weenie. But still I was not able to oust my prey, everyone on the table was playing AUS for redirections and the table was developing slowly. Everyone got 0.5. Third round I've had Al-Muntathir as prey. I agreed with my grandprey that we would block Summon History, and that completely shut him down. As a predator I had The Unnamed that also has helped me to oust prey quickly. Next prey was weenie-Gangrel with Thing – also great for me, he couldn’t block my +1 stealth-bleeds and handle Majesty. By the time I get to my third prey (!Gangrel wall), he was out of resources, so it was easy. And with all that pool and a stolen Veneficti (Mage) it was not hard to oust The Unnamed. What was your thoughts when you sat down at the final table? - My only thinking was that I should sit as far away from Otso as I can. He is the only one playing Potence, and that I can't handle. I didn't want to have Marius Iscru as my prey, but he sat down last. And how did the final play out? - The final played out totally unexpected for me. I've had a good crypt and opening hand. 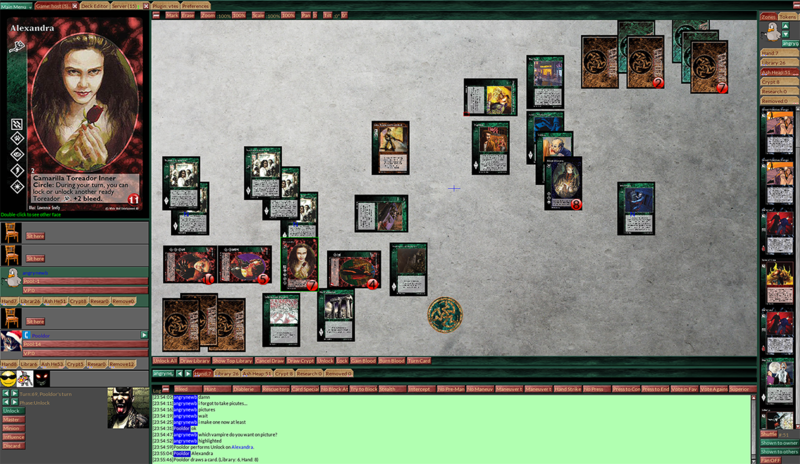 Again Scourge of the Enochians helped me, against Kim’s deck – she played with 2 minions for a long time. But I was not expecting to oust Marius, I guess he was unlucky with his master draw – he played no Toreador Grand Ball during the game. A turning point would be Otso burning Marius anarch cross table, which Marius replies with Banishment of Nana Buruku and Otso rushing Anson in return. At this point Kim couldn't stop me from ousting my prey and Otso had to oust Kim. Also Vincent playing Pentex Subversion on Enkidu have played a huge role in the final showdown. Unfortunately I can't say that I've played perfectly and made no mistakes. But with a lot of reactions the deck allows to fix them. Just should not be in a hurry when playing it. Analyzing after the game I think that I didn't put enough thoughts into my last turns because time was running out and I didn't want to stall the game. EC 2018 Day 2 final with Otso Saarilouma, Kim Nilsson, Ivan Chebunin, Marious Iscru, judge Pascal Bertrand and Vincent Ripoll. Do you think you have a special “style” of playing? - I like to play pro-actively, decks with a lot of actions and little or no defense. So playing this deck required from me to change a bit my approach to the game. But it worked out - so all good. Otherwise, what deck do you currently like playing? - Currently my favorite decks to play are two Followers of Set stealth-bleed decks; one based on Serpentis and the other run obf/pre. Both plays kind of similar and trying to win with a lot of output damage and have little defense. Thanks again for the interview Ivan, and good luck in future tournaments! • The first non-print-on-demand products from Black Chantry are ready for sale! Lost Kindred and the two Keepers of Tradition reprint bundles first appeared at EC 2018 in Warsaw, but will be available from various stores soon. 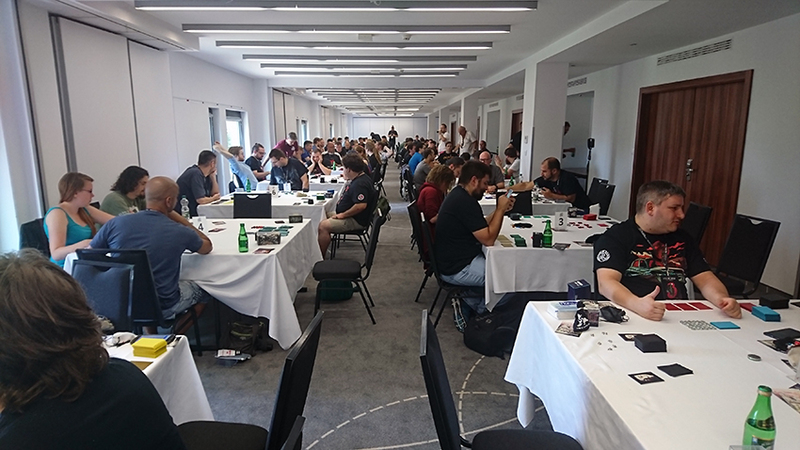 • Hugh, Henrik and Vincent of Black Chantry attended EC 2018 in Warsaw, where they had the pleasure of meeting many players. The representatives met the National Coordinators for an hour long session. We will return with more information about the subjects discussed at that meeting later, but some highlights were a reconstruction of the VEKN board, release schedule for new products (see this entry in the July VEKN newsletter), proxy use, event marketing, an upcoming code of ethics and the location of EC 2020 (Helsinki has applied so far). • Playtest of the next BCP product (a set of preconstructed decks) is being done as we speak, coordinated by Darby Keeney. If you and your playgroup are interested in playtesting in the future, please contact him – see this forum post. French players Serge, Maxime and Gilles has started a brand new VTES blog, pushing some great strategy articles: vtesinformationhighway.wordpress.com. For example, we can recommend the article “Choosing decks 101” for an archetype breakdown. Great work, keep it up! Other VTES blogs we especially want to promote (as they were updated recently!) are Charlotte by Night, Hun Fragment and ICLee´s Gaming Blog and of course the fantastic VTES One. Of course the VEKN encourage ALL blogging and similar activities about VTES. Maybe you too want to start a blog? And consider joining Dark Pack – check out www.white-wolf.com/dark-pack for information about that. The Tournament Winning Deck Archive (TWDA) is celebrating 20 years, and once again we have the great honour to get comments on a classic winning deck archetype from two of the games true giants: Pascal Bertrand and Otso Saariluoma. 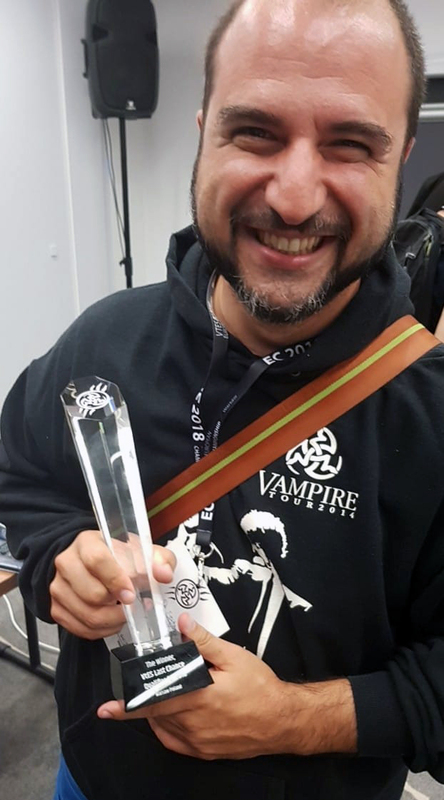 Apart from many victories, Pascal is a former VEKN Rules Director and the judge at many large events, most recently EC 2018. Otso is the 2011 European Champion with 24 (!) tournament victories. Just last weekend he was in two finals during EC 2018. Deck Name: Siege of LinCon: The Big Eye sees you! About the archetype: Would you consider taking this deck archetype to a tournament 2018? Otso: Sure, I´d take it to a tournament. I’ve been playing AUS-weenies (Malkavians with anarch tech) in tournaments more or less once a year since 2009 and I personally feel really in my comfort zone playing the archetype. The deck is really strong in what it tries to do and gives the player a lot of choices during the game. The deck does have some rock-paper-scissors type of matchups, however. I feel that I’d be incentivized to play this deck only if I have a strong hunch the meta would be favourable. This has indeed been my go-to deck probably 3 times in EC day 1 tournament and has yet to fail me getting to day 2. Pascal: No, I don’t think I would bring a Weenie Auspex to a tournament today. The main reason is that I have won a tournament with that archetype, and I’m happy playing something else. I doesn’t mean I wouldn’t play a wall deck, but weenie Auspex is one of the few that I ticked. However, I still expect seeing them from time to time, and building a deck must take into account this archetype. I enjoy playing against this deck, because it’s a well-known archetype that you’d know immediately, and this means every card you choose to cycle matters from the beginning of the game. I would consider discarding stealth cards twice if my grand prey was playing this. I still think this deck could be an inspiration to new decks. The disciplines are getting stronger with every set, and similar versions, using Animalism or Spiritus already exist. About the archetype: What do you think are this deck archetype's greatest strengths? And what do you think are their ideal prey and predator? Otso: The deck (at least the versions with heavy bounce) thrives in aggressive bleed-heavy metas with little or no combat. As for the immediate predator the deck prefers to have a stealth-bleed deck with enough pressure on them to force them to go for their VP, however unlikely. Also, with the average cost of a minion in this decktype being so low, you get to do a lot of actions – bleed for one and building up. The deck comes out of the gates fast even against turn-two-explosion-kind of decks like Rock Cats and Pander vote and remains strong at the later stages too. 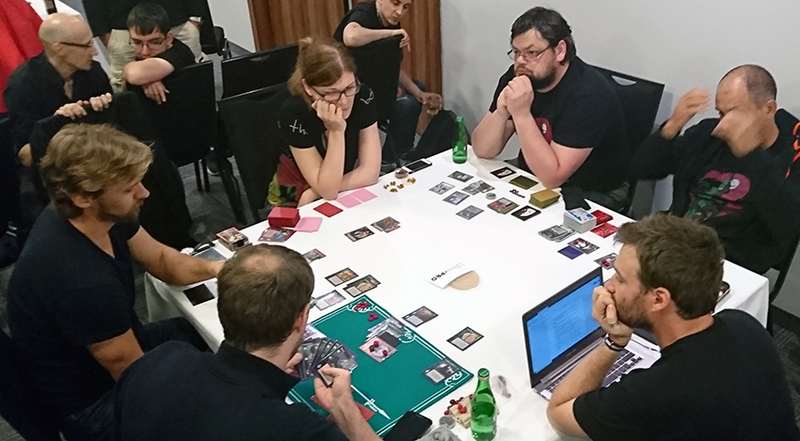 With constant light pressure and the ability to have some control over your prey’s gameplan the deck has the ability to close out games well in 2 hours despite its focus on defense – given the right table. I rarely time out with this deck compared to higher-cap, more combat-oriented, walls. Pascal: The weenie Auspex’s greatest strength lies in the hidden knowledge of how many wakes you have in your hand. As soon as that piece of information becomes public, your game gets much more complex, as your first objective will be to cycle. So, as long as you keep away from the Owl Companions, you’ll be fine. The deck is very resilient in a pool-aggressive environment – bleeds, votes, mainly. It can bring quite some minions on the board, meaning a “good” prey would be a deck that can’t handle 3-4 bleeds for one per turn, and won’t keep vampires up to take blows for their Methuselah. A good example for this would be a low-stealth bleed deck. 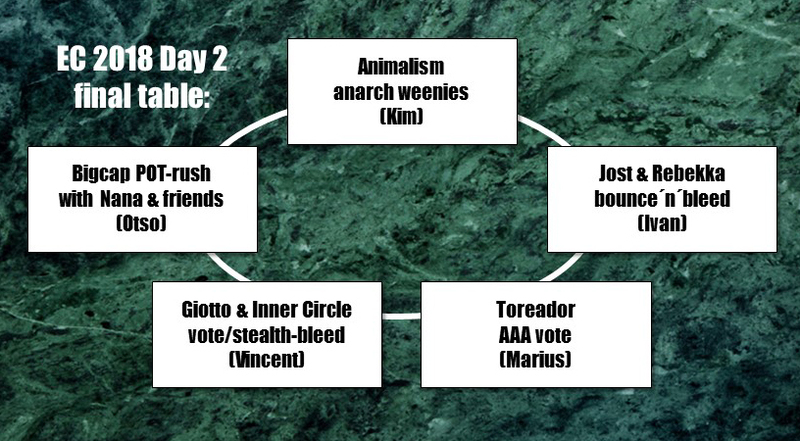 Think weenie DEM (no obf), or a low-stealth vote deck (Legacy of Pander). Now, about the predators, this deck comes down to the “turn 1 spoils it all” syndrome. Once you’ve brought up Isabel or someone similar, everyone is going to assume BigEyes everywhere. And players are afraid of throwing away their cards when they don’t want to get blocked. This deck’s weakness is on the ousting side, not on the not-being-ousted side. A good predator is one that will (most of the time, unwillingly) help you oust your prey by launching heavy bleeds. At this point in the game, your body expression does all the trick, and if you manage to convince them you don’t have any wakes/bounces, you’re closer to getting VPs than if you convince them you are some immortal piece of flesh, stones, and cardboard. An ideal predator thus being something that will bleed heavily, and not too often. Something in the lines of Unnamed, or a Lasombra Dominate bleed deck. About the archetype: What do you think are this deck archetype's worst weaknesses? Are there any especially problematic prey or predators, or other problematic issues? Otso: The versions I’ve played are a lot lighter on combat options than the presented list and have even more problems against offensive combat. Decks with the ability to hit your minions through your .44 Magnum or Sniper Rifle combat package are definitely problematic. Sometimes you do have the ability to wear them down with greater number of actions and attrition, but combat-capable decks are for sure what you don’t want to see at your table. Also the difference in sitting next to decks with zero intercept and even light intercept is huge. As long as you get to do your 1-stealth actions equipping, rescuing and hunting, you’re probably just fine. However, if either your prey or predator can choose to block your critical actions and reduce your minion count reliably, you’re gonna be in trouble. Voters across the table with incentive to kill you or voting predators with really heavy stealth might also pose some problems. One weakness, however marginal might also be, is that some people playing against you find getting the short end of the stick in the rock-paper-scissors game extremely boring for them and you might draw some table-hate and given the kingmaking position, they are probably not going to choose in your favor. Pascal: One of this deck’s major weaknesses is the blood management. Indeed, as you are playing small vampires that will regularly enter combat, you should expect them to lose blood from time to time. And something you definitely don’t want is to enter in combat with no blood and no gun, which can happen when being blocked. This can be avoided with Hunting Grounds or Blood Dolls – or permanent combat modules such as guns with maneuvers. But I think this deck’s main and biggest weakness lies in its lack of ousting power. A regular game being 2 hours, if you convince your predator that waiting for the game to end is a better play than trying to oust you, there is (unless you got the stars aligned) very little chance that you oust one prey, and even less that you’ll oust two. And, worse, people will first ponder for a good 5 seconds, then look at you and ask “Can I hunt? Can I Govern down? Can I recruit a +1 bleed retainer?” So, get this straight from the start of the game: time spent not playing the game is time lost in the game. Of course, what you want to avoid is anything that will mess with your “I block everything” strategy. These behaviors are to be expected from Potence, Animalism, and, broadly, combat decks. They might not oust you very fast, but they’ll probably deny you any opportunity of ousting your prey. And if they are your prey, well, just think of it as a tough time to endure. You don’t lose a battle before you’ve started it, so try and find something to improve about your play in a game where your prey runs Carna and your predator Stick. What are the most obvious changes you would do to this classic version presented above? Otso: The deck is definitely a product of its time with 90 card library and heavy emphasis on permanents accumulating value over time – and denying them from your opponents (Arcanum Chapterhouse, Unnatural Disaster). A modernized version might be slimmer and have more focus on temporary fixes – like Pentex Subversion and Direct Intervention. The biggest problem with this list for me, however, is the complete lack of bounces, which denies one of your greatest strengths and one avenue to victory. On the other hand, I do rather enjoy all the combat shenanigans and options with this list – Rötschrecks, aggravated damage, Ghoul Retainers and fast reactions, even if I’ve found that go-to-long, shoot-for-two is perfectly reasonable combat trump in itself. Pascal: My flavour runs Madness Network, which I love. This changes the crypt a little, and includes Victoria, and the synergy with her special ability. Apart from that, keep in mind that you’ll want to oust people. In this classic version, I think the equipment module should be updated, and feature more .44 Magnums. Setting the range is nice, especially against combat decks (Potence), but it won’t help you at all when Zoe bleeds for 1. The whole aggravated module is too heavy and too expensive. So you’re sending them to torpor, but with no votes, what are your plans? Letting someone else rescue them, I suppose. The reaction module is lacking a good 10+ redirections (Telepathic Misdirection, My Enemy’s Enemy) to help you remove pool from elsewhere. Two cards I fancy in this deck should very much be included: Smiling Jack (it doesn’t only get you rid of imbueds) and an option I took, the Anarch way, with Constant Revolution. How do you play a deck of the type? Do you play fast, slow, aggressive, talking a lot, not talking or what? Otso: As always, it’s important to craft some approximation of a game plan according to the table and work toward your immediate and long-term goals. The more you play the deck, the faster you’ll be able to make the decisions how to use your resources. One beginner mistake might be playing too much of the blocking game and not going for the VPs – Smiling Jack might win you some games, but bleeding for one is a lot more reliable way to oust. I was bleeding Michael’s Lasombra Nocturn deck, who was bleeding Caroline’s Miller Vote (and fight) deck, who was bleeding Marcin’s Princes with CEL and guns deck, who was bleeding Cesar’s weenie Auspex deck. It’s interesting to see Cesar and I had different approaches regarding the crypt and the decks themselves. To sum up the game (of which a video remains somewhere), Cesar was crushed by Marcin, Michael couldn’t really perform an action, and Caroline [Note: now Kari] and Marcin were acting one against the other. And the Smiling Jack, which I played on the first turn, hit 5, and then 6. This is about 40 minutes into the game, and we were playing at a great speed. Michael went to lunge and out Caroline. She declined blocks, but all other players (that is, Marcin, Cesar, and I) were eligible blockers for Eagle’s Sight. The first two passed, and Caroline turned to me and offered to help me oust Michael if I blocked Michael’s bleed. At that point, Caroline clearly had enough votes to oust Michael – and Marcin too. I thought a bit about it. And then Marcin entered the conversation, knowing that if I kept Caroline in the game, he would be out of it very soon. So Marcin offered to play a Parity Shift on Michael, if I let Caroline die. I paused and thought. And Marcin added that he’d rush Michael – which was a removal of at least two blood, helping me a lot. And to convince me, Marcin threw in that the rush would be with Fame. The fun part is that I didn’t have an Eagle’s Sight in my hand at that time. The less you say, the more they’ll imagine. Otso: Well, my experiences with the deck are based only on the Malkavian version, which – for me at least – is derived from Yannick Gibert’s list. After this there has been some tweaking and tuning and some tech innovations like the addition of rushing allies by Pascal in his EC 2009 LCQ list, which have been absolute beasts, and probably highlight that there’s more to this archetype than “Intercept everything!” even if that might be the TLDR version of the game plan. Pascal: I have linked two variants above which have been successful in a big tournament. Take a look, compare them, and analyze their different modules in order to find the one that suits your play style. Keep in mind that enjoying the game and ousting your prey(s) should always be your priorities. Thanks Otso and Pascal for these thoughtful comments! There is not much to add for a simple editor such as myself, but if you are interested in this archetype, please also read Extrala´s article about it, and also have a look at the previous articles in this series, about Ventrue lawfirm and Kindred Spirits stealth-bleed. 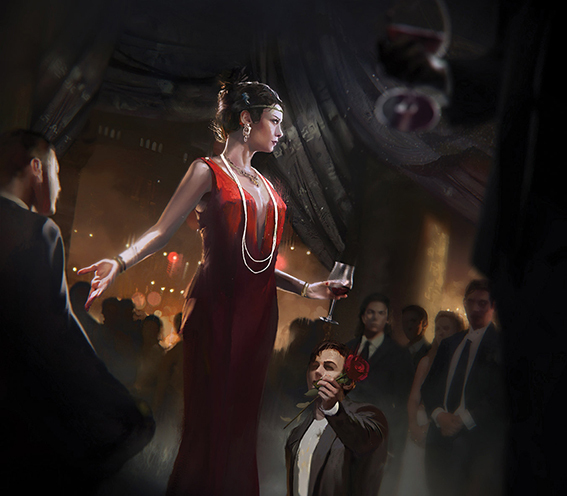 By the time you read this, Vampire the Masquerade Fifth Edition should be available at game stores all over the world. If you have the slightest interest in roleplaying games, we really recommend you to pick up a copy, as it is a very good game and the book is unbelievably beautiful. If you can´t find it at your local game store, make it bring it in for you, or order it yourself directly from the distributor Modiphius. Also, check out Worldofdarkness.com where you now can find a V5 Quickstart scenario called "The Monsters" for free download. And watch more episodes of The Gentleman's Guide to Gaming! 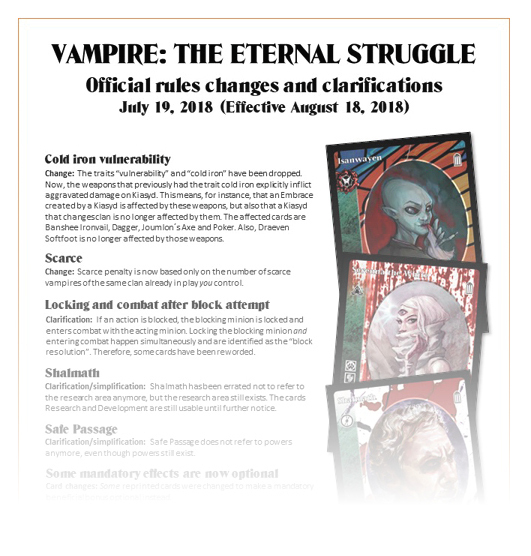 Rules Director Vincent Ripoll recently announced a batch of rules changes, this time associated with the Heirs to the Blood cards. As usual you can check out the summary in the PDF or read the full RTR at https://www.blackchantry.com/2018/07/18/rules-team-rulings-rtr-19-07-2018/. These changes will be in effect as of August 18, 2018. Ask questions about the changes by posting a topic about the specific rule or card on the VEKN.net forum, under “Rules Questions”. • One Rules Team Rulings were published this month – see above in this newsletter! Finnish NC Janne with Vincent, Henrik and Ginés. • Ginés, Henrik and Vincent from Black Chantry visited Finland and played VEG Helsinki 2018 on July 28. The trio was interviewed on video – check it out at Ropecons Youtube-page. Not only was this a perfectly organised tournament, it was also a weekend of great socializing and many fun casual games. 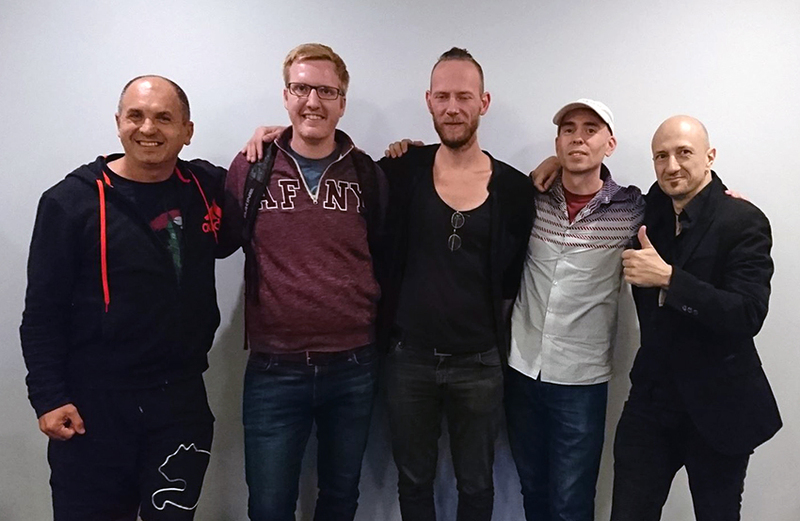 Thanks to all attendees, and special thanks to Janne, Petri, Otso and Noora! • Early this month, a work description/Lost Kindred favorites article were published. • Black Chantry are working on non-US printing and distribution - most likely the first of these European printed products will be available for purchase late August. More details about that will follow. • Many future releases are planned, but stating any dates is not worth doing, as weird trouble tend to appear when you least expect it. However, some things have been said: Anthology will (kind of) be printed again, various beginner-friendly products will soon be available, a bunch of preconstructed decks, one or two Anarch-themed bundles, and a big set with the flavor of Vampire: The Masquerade Fifth Edition. Fun times ahead! MIKA NURMIKOLU WINS VEG HELSINKI 2018! 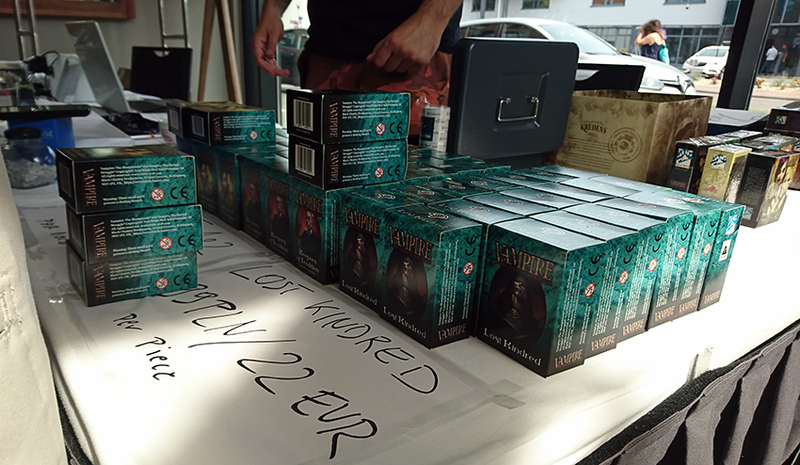 Ropecon is Europe's largest non-commersial convention for tabletop RPG:s, boardgames, cardgames and all kinds of such stuff, with over 4,000 visitors each year. 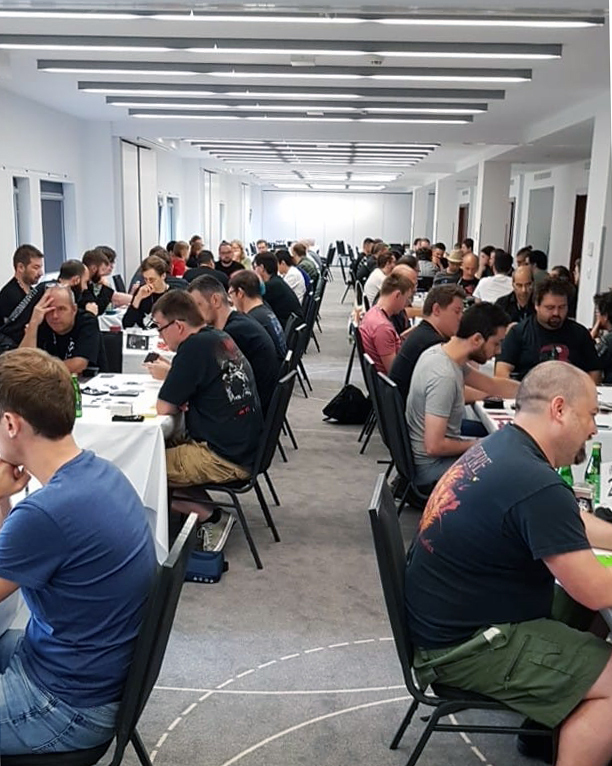 It has had VTES tournaments for about 20 years, and this year the main tournament was “upgraded” to VTES European Grand Prix status. 49 Methuselahs turned up for this battle, including players from France, Spain, Sweden, Belgium, Austria and Italy. 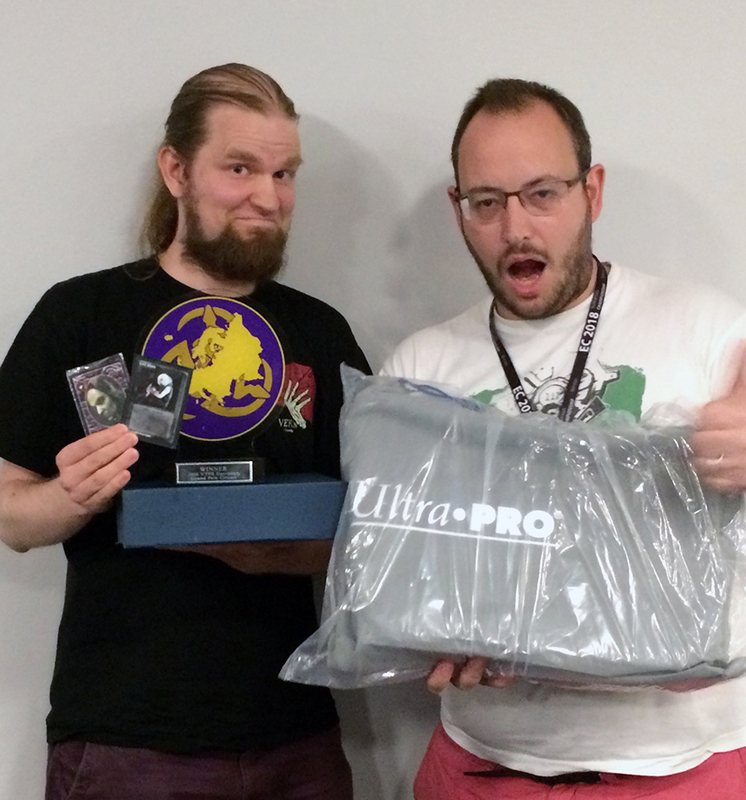 Congratulations Mika Nurmikolu, who took home the Grand Prix trophy in a convincing way with his Goratrix wall deck. Just like last year, the whole final was streamed and can been seen on Youtube, together with interviews. Commentary by Janne Lönnqvist (Finland NC) and Ginés Quiñonero (VEKN Chairman and Black Chantry art director). Thanks to event organizer and head judge Petri Wessman, and also a big thanks to Orian Gissler, VEKN Organized Play Coordinator and in charge of the whole VEG 2018 tour (who was sponsored by Ultra Pro). WHAT ARE THE MOST POPULAR CARDS IN TOURNAMENT WINNING DECKS? Of course, someone who has time and skills can create lots of interesting lists and comparisons out of the data. Feel free to do so, Tito´s Excel file can be downloaded via this link. Join the discussion about this subject at the thread "TWDA Analysis" on the VEKN forum. 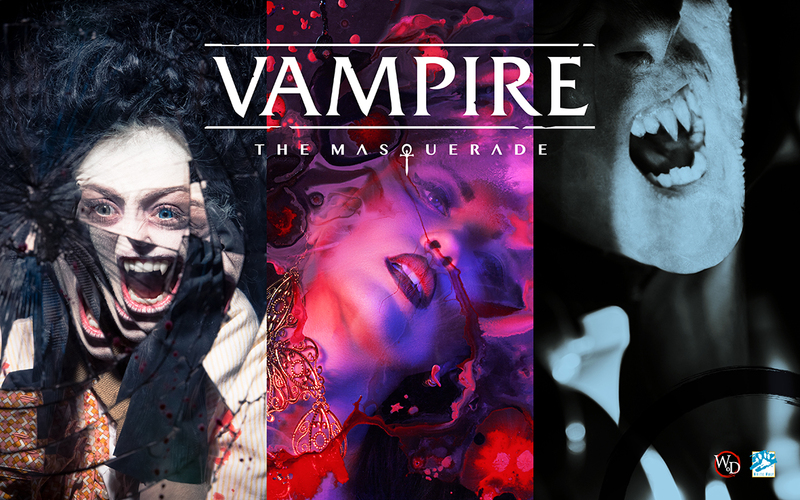 Our friends at White Wolf are launching the Vampire: The Masquerade Fifth Edition the coming weekend at GenCon in Indianapolis, USA. You can already order the physical V5 corebook from the distributor Modiphius. Digital copies will be available for download on worldofdarkness.com from August 2. Your local game store will have V5 in stock some time in the following weeks, and the game will also appear in French, German, Italian, Spanish, Russian and several other languages later this year, as will the Camarilla and Anarch sourcebooks. 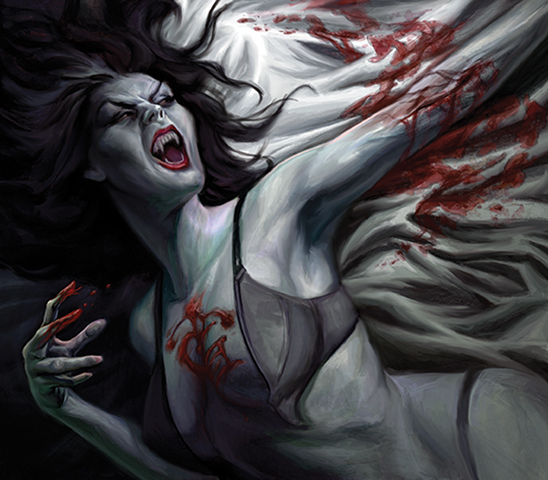 If you are interested in World of Darkness lore, we also recommend White Wolf writer and VTES player Matthew Dawkins video series “The Gentleman's Guide to Vampires”, now with new V5 episodes: Prologue and Second Inquisition, and many more on their way.